Sheet 43G/H (1943 series map). 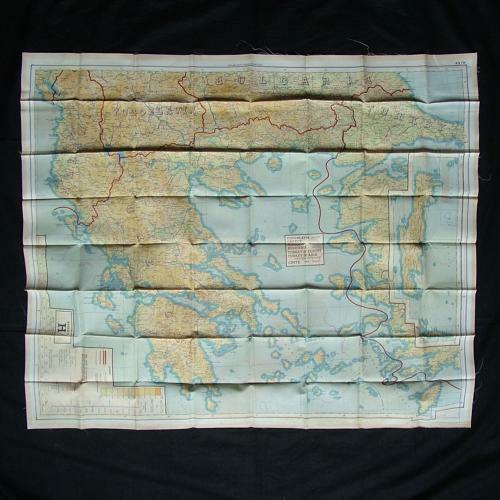 Large double sided colour silk/rayon map, approximately 92 x 78cm. 1:1000,000. 43G covers Czechoslovakia, South Eastern USSR, Hungary, Romania, North Eastern Yogoslavia and areas of Bulgaria and Albania. 43H overlaps with the southern margin of sheet 43G and shows Southern Yugoslavia, Greece, Southern Bulgaria, part of Turkey and Crete (inset on the right on the map) Raw, unhemmed edges. Folded/creased. Excellent condition. Lovely large map. Stock code E22154.